(ii) Handloom Weavers Comprehensive Welfare Scheme is being implemented for the Handloom Weavers comprising health, life and accident insurance components as available to the artisans in the handicraft sector. Both the above programmes are under merger with national-level programmes for health and life and accident insurance. Separately, the Ministry also implements the National Handloom Development Programme, the Yarn Supply Scheme as well as the Comprehensive Handloom Cluster Development programme under which the Ministry provides interest subvention, margin money, credit guarantee and yarn at subsidized rates, among other things, to the handloom weavers. 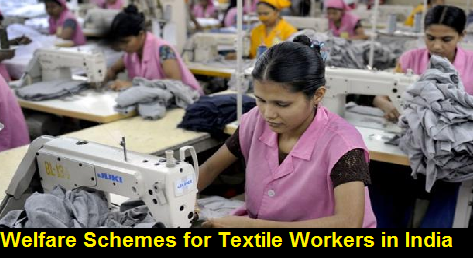 (iii) Group Insurance Scheme for Powerloom workers: The scheme provides insurance cover in the case of natural death, accidental death as well as permanent and partial disability due to accident. The scheme is being implemented since 2003-04. (iv) Under the special package provided for garments and made-ups, the government additionally provides 3.67% share of employer’s contribution towards provident fund in addition to the 8.33% being provided under Pradhan Mantri Rozgar Protsahan Yojana for all new employees enrolling in EPFO for the first three years. The Government has also made employees’ contribution to EPF optional for employees earning less than Rs. 15,000 per month under the special package for garments and made-ups. Ministry of Textiles has been implementing Integrated Skill Development Scheme (ISDS), a central sector scheme, across the country. ISDS caters to the skilled manpower needs of various segments in textile industry including traditional sectors and largely addresses the entry-level skill development requirement of the mainstream textile industry. In addition, training to handloom weavers/workers and artisans is conducted under various plan schemes of Development Commissioner (Handlooms) and Development Commissioner (Handicrafts). Component-II of ISDS provides for Skill Development in partnership with the private sector including industry, under PPP mode. 63 industry partners and private institutions have been roped in and assigned training programme under ISDS. Ministry of Textiles has aligned implementation of ISDS as per the framework adopted for skill development by Ministry of Skill Development & Entrepreneurship. The above information was given by the Minister of State, Textiles, Shri Ajay Tamta today, in a written reply to a Lok Sabha question.